This Nuno Felt scarf was created by binding superfine merino wool to Habotai silk for a light weight "silky wool" scarf. The scarf was then naturally dyed with eucalyptus leaves (collected from the fishing village of Wanchese), maple leaves, and miscellaneous rusted objects. 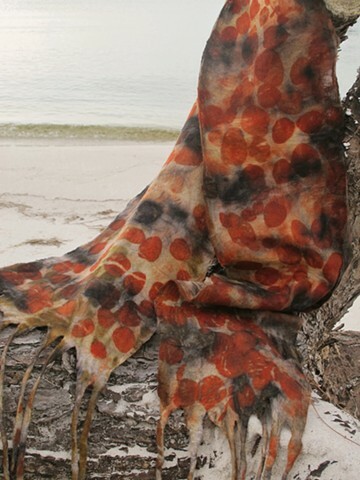 The eucalyptus leaves imprint a surprising rusty orange color, creating this perfectly pretty fall scarf.